At the end of 18th century, a lot of private investments had enabled to erect those who today are considered masterpieces of art and architecture. 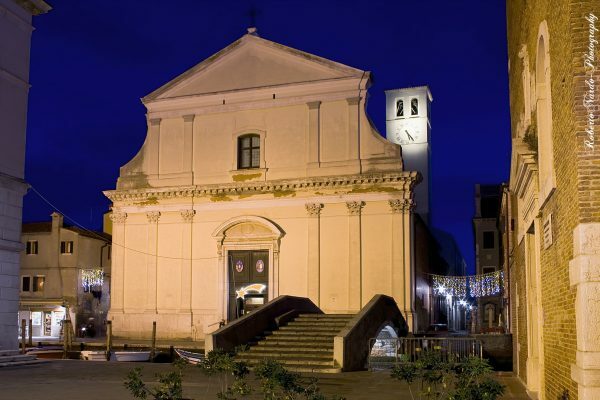 The contribution of the venetian earl Ludovico Manin was very influential, in fact he decided to finance with his own funds some structures, such as the Oratory and the Chiesa dei Filippini of Chioggia. Externally, the church reflects the 18th century style. The front presents some neoclassic references. The top, the bell tower in particular, vaguely reminds the Romanesque style, typical of the Middle Ages. Everything is surmounted by a beautiful triangular tympanum. The inside has eight extraordinary bas-reliefs, representing the story of San Filippo Neri realized in terracotta by the artist Giuseppe Maria Vianelli, between 1860 and 1870. The altar, realized in 1772, has an extraordinary artistic value and the rectangular fresco on the ceiling is considered one of the most important works of the artist Giacomo Casa, who was born in Conegliano in 1827. The fresco represents the Virgin Mary adored by San Filippo, while the lower part represents the presentation of the Church’ project to Earl Manin. The masses which are celebrated at half past six in the morning during the Advent are called “Rorate”. This kind of mass dates back to a fifteenth century tradition of alpine regions. These masses, dedicated to the Virgin Mary, are celebrated by candlelight. It is possible to visit the church every day. From 8:30 am to 12:00 and from 4:00 to 6:00 pm.